Thanhouser Career Synopsis: Marguerite Snow was one of the most important Thanhouser players. She appeared in many leading roles and was widely featured in advertising. Among her more memorable roles was the second or "heavy" lead in the 1914 serial, The Million Dollar Mystery. At one time she was the wife of Thanhouser actor James Cruze. Biographical Notes: Marguerite Snow was born on September 9, 1889 (some accounts say 1891 or 1892; she kept moving her birth date forward) in Salt Lake City, Utah. (Some listings give Savannah, Georgia; a 1916 listing in Motion Picture News Studio Directory gives her birth date as September 9, 1892, in Atlanta; an obituary in The Los Angeles Examiner, February 19, 1958, gave Denver as her natal city.) Her father was William G. Snow, a long-time minstrel comedian and half of the Snow and West act. Her mother, the former Marguerite West, was the other half of the act. Miss Snow spent her childhood in Denver and was educated there at the Loretta Heights Academy. Her stage career began in 1907 with James O'Neill in The Count of Monte Cristo. Later, her managers included Henry W. Savage, J.W. Gates, Delamater and Norris, and Walter Lawrence. As a member of the Belasco Theatre stock company in Washington, D.C., she had leads in Peter Pan, Old Heidelberg, The Christian, The Devil (in which she played the heiress), The Road to Yesterday, and other productions. In 1908 she appeared on stage in the Garden Theatre, New York City, in The Devil. 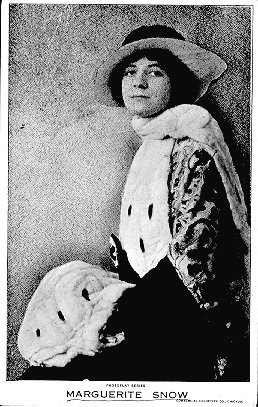 Miss Snow played the title role in The College Widow under the management of Henry W. Savage, and in a 1914 biographical sketch was noted as "the only brunette that ever played that part." On the West Coast she was a success in Mrs. Temple's Telegram. "[After a morning's work] we climbed back into the automobile, this time with Mr. Cruze and Mr. Farrington as companions, and were whisked off to the Cruze homestead for a bite of luncheon. As all, or certainly most of you know, Miss Snow is Mrs. Cruze in private life and the Cruzes have a most comfortable, attractive home in New Rochelle, about five minutes' walk from the Thanhouser plant. The very air of the house spells comfort, without ostentation of display, and their marriage, a genuine romance of the studio, may truly be said to be an ideally happy one. You have only to be fortunate enough to see them in their home to realize that fact. The ceremony of luncheon completed, it was still some time before they would be required at the studio, Miss Snow and I lingered over our coffee cups for additional intimate chatter. Meanwhile, in the livingroom, Miss LaBadie played Victor Herbert's fascinating Badinage upon the piano, while Mr. Cruze smoked innumerable cigarettes. "All the same, and despite her protestations, I cannot but believe that there must come occasional times when the lure of the stage door is poignantly felt by Miss Snow. Very few young actresses there are who have been more successful than she, especially when you consider that her stage experience numbered less than five years in all. She studied in Denver under Marguerite Fealy, Maude Fealy's mother, and during the summer of 1906 played one or two small parts with the stock company at Elitch's Gardens, Denver. What might be called her real stage debut occurred February 11, 1907, at the Crawford Theatre, Wichita, Kansas, when she played Mlle. Danglars in Monte Cristo, in the support of James O'Neill. The very next season Miss Snow stepped into the title role in Henry W. Savage's production of The College Widow, and the next season came her Broadway debut, when she created Elsa in The Devil, at the Garden Theatre. After that came a season in stock work, divided between Grand Rapids, Michigan, and Wheeling, West Virginia, and in the fall of 1910 she was seen at the Bijou Theatre with Thomas Jefferson in The Other Fellow. This play being a failure, I suspected that then she returned her thoughts towards picturedom. It was so...."
The Indianapolis Star, January 22, 1911, told of an incident in her stage career: "Miss Marguerite Snow, who has just returned to New York after finishing an engagement, was present at a dinner when the subject of disagreeable weather came up. 'When I was playing at the Willis Wood, in Kansas City, two years ago,' said a young woman, 'we had an awful sleet storm. The streets became so slippery that 27 horses fell and broke their legs. All were shot. The noise of the revolvers sounded like a battle.' Everybody gasped and a short period of silence followed. Then a young man spoke up. "'When I was in Denver, playing at the Broadway,' he said, 'the snow was so deep and slushy that every woman who attended the performance wore rubber boots which she removed and checked in the foyer. One woman lost her boots and had to remain in the theatre all night.' There were more gasps of astonishment. Miss Snow was the next to score. 'I was in a company that opened in Salt Lake City one winter,' she said. 'Two Utah men were the financial backers of the show. The night of the opening performance the frost was so thick it froze the pocketbooks of the angels and there was no show.'" With Thanhouser: Her screen career began at Thanhouser in 1910, where her first role was in Baseball and Bloomers, released on January 6, 1911. Soon she became the leading lady in numerous pictures. However, in the summer of 1911 she returned to the stage for a short time, after which she acted in films for Kinemacolor for two months. 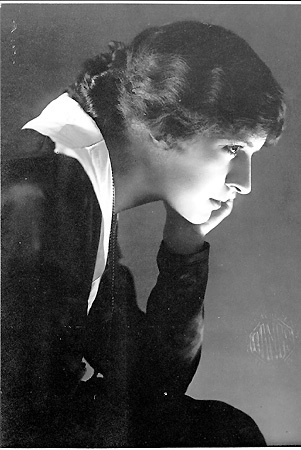 Returning to Thanhouser, Marguerite Snow eventually became one of the New Rochelle studio's best known actresses. She married James Cruze, Thanhouser's most famous actor. The Photoplay Arts Portfolio of Thanhouser Moving-Picture Stars, 1914, told of her beginning with the company: "Her introduction to moving pictures was in a sense an accident. While witnessing a production of a play at the Thanhouser Film Corporation at New Rochelle, she was asked to play an incidental part. A few days later one of the directors requested her to play the heroine in a feature film. This was done so successfully that she later appeared in Lucile, East Lynne, Jess, and She...."
By autumn 1911 she was sufficiently well known to finish second, after Florence E. Turner, in the popularity contest for movie actresses staged by the New York Morning Telegraph. The edition of December 17, 1911 credited Miss Turner, of Vitagraph, with 135,000 votes, Miss Snow with 97,950, and the third-place winner, Mary Pickford, of Majestic, with 64,007. Others among the top finalists included: Octavia Handworth, Pathé, 44,853; Mabel Normand, Vitagraph, 34,049; Kathleen Williams, Selig, 33,224; Kitty Price, Vitagraph, 28,656; and Julia M. Taylor, Thanhouser, 25,114. Article in the New York Morning Telegraph, April 12, 1911: "Miss Marguerite Snow, formerly leading woman of The College Widow, My Cinderella Girl and a number of other attractions was brought up in Colorado and when a girl learned to shoot a rifle. Yesterday she was at New Rochelle. While walking with a girl friend up there they came upon two small boys with a rifle. 'Kin you shoot?' asked one of the boys of Miss Snow. 'You bet,' she replied. 'Le's see you hit that rooster,' came from the youngster. Acting on impulse, Miss Snow levelled the gun and put a bullet clear through the fowl. At that a woman came out of a house and demanded $3 for her rooster. Miss Snow paid. As she moved away she heard the boy yell: 'I knowed we'd ketch a sucker 'fore long, ma.'" Article in The Billboard, November 18, 1911: "Marguerite Snow, or 'Peggy' as she is familiarly called around the Thanhouser studio, is the leading woman in the Thanhouser Stock Company. Miss Snow comes from Savannah and is the daughter of Billie Snow, the well-known minstrel. Although she played many parts while still a child, her real stage career did not begin until she was 16 years old.... Miss Snow believes that motion pictures offer a splendid opportunity and is the best training an actress could desire. Miss Snow is not only a very handsome and attractive young woman, but has a winsome personality. Her popularity with the people who see her is unbounded. She has a natural talent for pantomime expression and is a pronounced success in the silent characters she has interpreted...."
"'She's only three,' said Miss Snow as she put the letter back in the envelope." Article in The Minneapolis News, November 7, 1913: "'There is much better moral tone in the average moving picture play than there is in the average stage production,' said Marguerite Snow, star of the Thanhouser company, in comparing the two professions. 'There is a very good reason why this should be so. There are censors of photo plays who make it a business to pass upon the films before they are shown. If there are objectionable features they must be cut out before the picture is O.K,'d. This is seldom the case with the speaking play.'" Mention in Jean Darnell's "Studio Chat - From the Inside" column in the December 1913 issue of The Photoplay Magazine: "Marguerite Snow is very busy these days shopping. She says: 'You know, winter will soon be here, and I won't even have any tiny leavings from last winter, as I lost everything, even my seal coat, when the studio burned, and I spent the winter in California, where we didn't need heavy clothes. You see, everybody over at the studio has it on me for something to slip on these cool days while they shop. Don't I want to go back to California instead of having to have heavy clothes? No siree! I'm going to stay in New York this winter. I love to sleighride and skate, and such sports are unheard of in California." A 1912 Chat: The Photoplay Magazine, December 1912, printed an article by Estelle Kegler: "Marguerite Snow wants a bungalow. You know, one of those snug, brown-shingled affairs with a six-foot open fireplace like they used to have when grandmother was a girl, and a wide gallery with pink roses rambling all over the place. Miss Snow calls it 'gallery' because she comes from the sunny southland where verandas are known by that name and where roses run riot. In the evening, when the day's scenes of excitement, humor, pathos, and tragedy are over and folks are filing in to see their favorite add new laurels to her crown of picture achievements, she is perched up in the midst of a mound of rose-colored pillows in the quaint old Washington Inn, New Rochelle, drawing her castles in Spain, which in this case are picturesque bungalows by the seashore. "'I love the country,' she sighed when I found her there, engrossed in the ground plans for her latest idea for the ideal home. 'It's so real, so sincere. It makes you trust and believe in everybody and everything.' Miss Snow has the biggest and the darkest and the brownest eyes you ever saw. They are aflame with the joy of life, and yet, there is a shade of melancholy in their brooding depths. Perhaps it is the mystery of the shadow cast by her sweeping black lashes, accentuated by the dark arch of her brow. If you have seen copper glinting in the firelight you know the color of her hair. If you know the soft tints of old ivory you have seen the polished cream of her skin. She is a bronze and brown girl, all done in the warm tints of her native South. "Miss Snow consented to let me peek at these missives from the many. The actual number of them would sound like fiction, so I won't give it. 'And you mean to say you answer all these?' I protested. 'All of them. They are my jewels of conquest. Some day I shall sit by the blazing log in my bungalow and, turning back the pages of fragrant memory, live them all over again. And I shall be happy, very happy, to know I have been truly loved.'" Motherhood: The Moving Picture World, January 17, 1914, told of Miss Snow's "vacation" away from the studio: "Miss Marguerite Snow, the popular leading woman of the Thanhouser Company, has just returned to the studio after an absence of six months, during which time she has been taking life easy. Miss Snow had been with the Thanhouser Company three consecutive years before she had taken a vacation. The rest has been greatly beneficial to her, and she feels able to do even better work than heretofore...."
Her hiatus extended from about May to November 1913, however the real reason for her absence was to prepare for the birth of her daughter, Julie Cruze, on October 24, 1913. In November she was back on duty at the New Rochelle studio, working on Peggy's Invitation, in which she played the title role. However, a note in February 1914 issue of The Motion Picture Story Magazine informed readers that "Marguerite Snow has been ill for some time," possibly a belated and incorrect commentary about her earlier pregnancy. "We looked up from the topmost of a pile of letters that littered the desk of the cozy den into the smiling eyes of 'the most beautiful woman in the world' - of Marguerite Snow - for it was she to whom the unknown writer had addressed the above lines of eternal admiration. 'But you are not Carmen,' we protested, setting down the cup which Miss Snow had just handed across the little tea table. 'Carmen could never have made such delicious tea as this! And, besides' - 'No, not Carmen, nor the 'Marble Heart,' either; nor 'Jess,' nor 'She,' nor the 'Caged Bird,' laughed the charming star of the Thanhouser Company. Her expression suddenly became somewhat serious. 'You know, while I really appreciate these countless letters idealizing me as one or another of the many characters I have played, I often wonder whether these same writers would see anything to grow eloquent over in plain Peggy Snow.' 'Plain?' we murmured into the tea cup. "'Because, after all, I would much rather be myself than any character I have ever played.' And the young actress lay back in her chair, smiling. And let it be here noted for the benefit of those unfortunates who have never seen it, Marguerite Snow's smile is a wonderful thing. The keynote of Miss Snow's charm as an actress is perhaps best understood by realizing that she is most charming when she is just her natural self. In other words, in assuming any role, whether it be that of princess or shepherdess, the quality which makes each appealing according to its requirements is hers to start with. There is no suggestion about her of the staginess or artificiality almost inseparable from the average woman whose lifework is assuming emotions not her own. Marguerite Snow can be sweetly ingenuous as 'The Blacksmith's Daughter,' or cynically sophisticated as 'The Woman in the Case,' demure and simple hearted as Elizabeth in Tannhäuser, weirdly grand as 'She,' or recklessly, almost insolently, fascinating as Carmen - all these she can be, but she is always most charming simply as Peggy Snow. "Miss Snow has some interesting comments on the difference between the stage and photoplay work. The latter she finds more interesting, though equally arduous. 'You see,' she explained, 'there is always something new - no doing the same thing over and over again. A legitimate actor or actress, no matter how talented, requires a certain amount of experience in playing for the 'movies' before he or she can to use our vernacular, get it across the film. They do not realize, obvious though it is, that the voice, which is their great medium of expression on the stage and to which they give so much attention, is useless, nonexistent, before the moving picture machine. "'Then, too, they miss their audience - the sea of faces which has become part and parcel of their performance - and standing for the first time before the camera - at which, by the way, they must never look at - they are invariably seized with stage fright of the worst kind. Well known actors who have held vast audiences spellbound pose awkwardly for their first moving picture and stare helplessly at the camera; they're not even able to light a cigarette, much less to roll one! Of course, they generally get over it, and the more experience they have had previous to picture work the easier it is. After all it is merely a matter of losing self-consciousness. "'Have you ever had any really dangerous experiences?' 'A number of them,' she said reminiscently, and the laugh had gone out of her voice. 'One I can never forget - it was not sensational in the ordinary way, but it was - it was horrible. I was taking the part of a farmer's daughter, and was driving a big reaping machine along the side of a field bounded by a stone wall. I was perched 'way up in the air on a little iron seat without any back to it, and was doing my best to look as if I knew how to drive the four big horses. Below me the interlocking knives were churning away at top speed, snipping and casting up the thick sheaves of grain. All went well until it came time to turn. 'Pull to the right!' called the director. "Two weeks ago Miss Snow was finishing some scenes in New York City of a picture which was to be completed at Niagara Falls. The last scene was taken one morning in lower Broadway. The actors had finished and were getting into their big touring car, when a little newsboy - who had come from the edge of the crowd recognized Miss Snow the idol of his leisure hours - broke through and pushed forward to get closer to his adored Marguerite. The car started off, jerking him aside, and just then a motor-truck rumbled by. When it had passed the little newsboy lay unconscious on the curb, his shoulder crushed. His broken-off cry and a policeman's shout halted the touring car and Miss Snow, who had seen the little fellow pressing forward, jumped out and hastened to his side. An ambulance hurried up, and as the white-coated attendants were carrying him in, the boy opened his eyes. They fell upon the face of his fair idol bending solicitously over him. He smiled - as newsboys rarely smile - and again lapsed into unconsciousness. "Miss Snow was due to take a late afternoon train for Niagara Falls with the rest of the company, and accordingly planned to call at the hospital early in the afternoon. When she returned to her hotel she learned that the manager had rearranged the plans and they were all to leave on the 2 o'clock train. It was then half-past one. If she went to the hospital she would miss the train. But she was determined to go to the hospital. She went - and in the large cluster of roses which she left there the little newsie had a fragrant remembrance of the sweet, young actress who had bent over his cot - of her with whom he had talked face to face. Outside the hospital James Cruze, the leading man of the Thanhouser Company, was waiting in his 90-horsepower Itala. It was then after two - but they caught the train at Croton. "Miss Snow is at present at work on a 46-reel picture, The Million Dollar Mystery, which, it is said, will be the most sensational feature picture ever produced in this country. It includes, among other thrilling episodes, a rescue from a housetop by a swiftly moving balloon. It is interesting to know that the costumes which Miss Snow will wear in this series were made by the highest priced dressmaker in New York and represent an expenditure of over $14,000. But if any one can wear such clothes, it is Peggy Snow." A 1914 Interview by Mabel Condon: The Movie Pictorial, July 25, 1914, printed this article by Mabel Condon, a well-known feature writer who at one time also operated a publicity agency: "MARGUERITE SNOW - Otherwise Known as Peggy - She is just 'Peggy' to everyone out at the Thanhouser studio in New Rochelle. But to the outside world, a world that also bestows upon her homage and affection, she is Marguerite Snow. And she is stately and dignified to that outside world, because that is her popular screen characterization. But to the studio folk she is a laughing, fun-making Peggy. Back of the laugh and back of the fun, however, even those who call her Peggy, are aware of the haughtiness of manner that is hers inherently and not by right of acquisition. "You've seen her so, in East Lynne, in A Woman's Loyalty, in The Marble Heart and you've also enjoyed her queenliness as 'Jess,' as 'She,' as 'Undine,' as 'The Woman in White,' as 'Lucile.' You've followed her varying moods as they enchanted or repelled in her portrayal of 'Carmen' and of 'Dora Thorne.' And now you're enjoying her as the Countess Olga in The Million Dollar Mystery. She is victorious and she experiences failures in this, the role of the intriguing and unscrupulous countess in what is perhaps the most-talked of film of the day. A forty-six chapter film, novelized by Harold MacGrath and put into scenario form by Lloyd F. Lonergan, that astounding Thanhouser editor, who has probably written more scenarios than anyone else in the world. It has a wealth of novel and daring situations, of wonderful interior settings and of nature's own scenery, of plot and counterplot. And let us not omit a feature that arrests the instant attention of the feminine filmgoers, its variety and in the appearance of Marguerite upon the screen. "'It was a most important consideration. But when I adopted motion pictures as a profession - or they adopted me! but I'll tell you about that later, I made the discovery that clothes count even more. Not that they have to be of the finest nor of the most expensive weaves, but that they conform to the newest styles and that there be lots of them - lots of clothes, I mean. Yes, and lots of style, too,' she added. 'And do you know that each of us advances in style along her own personal ideas? And we do so by putting another twist in a hat that would look lovely on one person but homely on another, or by adding something - a tuck or a plait or a bow - to a blouse or skirt that was otherwise stupid and commonplace. 'Clothesosophy' - a study of clothes! Why not?' she demanded seriously. And you agreed with her, - Clothesosophy? Indeed,why not! "If Miss Snow had not been so firm a believer in good-dressing, she probably would not have looked as charming as she did, at just that minute. And she had not expected company, either. Company, in fact, had been quite the farthest thing from her calculations. But when one of the Thanhouserites had called up to the second-floor apartment from the studio yard, 'Peggy, we're coming up!' Peggy had answered from the tiny back porch, 'All right - come on!' So you came, and 'Peggy' in her Chinese embroidered negligee that was the blue of the newest of blue shades and that swung its wide blue sleeves far from its wearer's white wrists, reclined in the deep, billowy brown leather pillows of the brown divan, and quite naturally the conversation drifted to that of clothes. "And 'Peggy' spent the biggest part of her rest-hour in pleadings for her sisters - meaning the world of women and girls - to make the best of what they have, no matter what that may be. She slipped a blue slippered foot over the soft richness of the rug, the while she discussed clothes - and other things. She told how she had first come to the screen and how very accidental the coming had been. It was when she was playing The College Widow. Imagine a brunette college widow! But that's what she was and by so being was the first and only such in that role! Anyway, it was near the close of her season and through somebody who knew somebody at the Thanhouser studio, Miss Snow was invited to join a visiting party to watch scenarios in the making. "'I was so interested, all I could find to say was 'Wonderful! wonderful!' Miss Snow laughed, looking reminiscent. 'Then somebody said 'Stand over here and do so and so and so.' And for days afterward I wondered how I had done it and how I would look if my impromptu part ever came to light on the screen. Then a real surprise came to me in an offer from the company to work for them. So I left the stage and came. I found it entirely different from the work of the stage. One has to unlearn everything, almost, that the stage taught and learn the art of picturizing along entirely different lines. So many people do not seem to realize this is so. "The coziness and fitting-in of colors and objects in the tiny Snow apartment testified to the occupant's close knowledge also of homeology. For her apartment first suggests that title 'home.' After that you remember that it also is an apartment. As brown is the color you think of most in regard to Miss Snow, so brown is also the keynote of the tone and tint of the Snow apartment home. There are soft restful greens and glints of bright orange, too; but you carry away with you an impression of richness of decoration that runs to brown. 'It's my favorite color and I use it in everything possible,' Miss Snow said, as she moved among the brown things, her blue robe trailing its weight of silken embroidery over the rugs that covered the polished floor with silence. 'I love it in the changing leaves in the fall - and I love it best for my fall suit,' she finished with a laugh. And evidently the color loves this ardent exponent of it, for it tints her hair and enhances her eyes and sets off the whiteness of her skin with a warmth that gives her the best right in the world to name it her color. "It was some time after you made the acquaintance of 'Peggy' in her home that you again met her. It was months, and the 'Peggy' of then and the Peggy of now, seemed to have taken on a newness of some quality that was hard to define. You saw her for only a few minutes in the Thanhouser studio yard that offers the freshness of fresh air and a brightness of bright sky to those unoccupied in the interior studios. 'Peggy! - Wait!' somebody called out and you turned and saw her. It was a girlish Peggy in a neatly fitting tailored suit and minus a hat. Her brown hair in the sunlight held glints of gold, and the brown eyes shone clear and firm. 'Firm' doesn't exactly sound like the right word but it comes nearest being the right one. Anyway, 'Peggy' responded with a laugh and linked her arm in that of the girl who had called to her and together, they ran up the incline that leads from the studio to the street. That was the girlish, laughing, fun-making 'Peggy.' And it seemed rather impossible to associate her with the Marguerite Snow who was all stateliness, all preciseness and all dignity, as her trim walking suit and smart hat seemed to desire their wearer should be. "And there were no browns, except the strand of hair drawn down over one side of her forehead and showing under the tilt of her hat brim. Her suit was blue with a girdle of emerald green. Her wrist-bag was lined with pink satin that sent the sheen of it across the studio room. And in its mysterious roundness, Miss Snow felt with her white-gloved hand for her powder-puff and with it, daintily dusted the end of her nose and chin, before the 'Ready!' signal came for her to go on as the Countess Olga in a scene from The Million Dollar Mystery. 'Very well, Mr. Hansel,' Miss Snow replied, and found the yard and the chatting groups scattered about it and, walked with you to the corner on which stands her apartment house home. It is a haven of rest with a four-o'clock offering of tea and cake for the weary, that apartment house home. There, hospitality is enthroned, and 'Welcome!' is the pass word that all the Snow friends know. And 'Peggy' is the genie of the silver tea service or of the groaning table and she reigns by right of a nature-given gift. But of all the 'Peggys' I have told you about, I return to the one of the bluest of new blue negligees with the Chinese embroidery that weighted it down. That was the 'Peggy' of the rich browns and the soft greens and the once in a while glints of orange, as a background. And it was the 'Peggy' that nestled into the brown of the cushioned divan and the subject of clothesology and you decided that of all the 'Peggys' you had met at Thanhouser-ville, THAT 'Peggy' was 'Peggy.'" "Peggy Snow is beautiful! To look into her eyes is to see beyond the limpid depths. Glorious thoughts of her own Southland (she was born in Savannah) comes to one, and soon they are hypnotized by a mirage of enchanted vistas and rolling plains, dotted here and there with bloom-laden magnolias. Burns furnished the world deathless poetry about Highland Mary; our own Edgar Allen Poe found fame with his eulogy on Annabel Lee, and were some poet to gaze into the eyes of 'Peggy' divine inspiration would be his to set the hearts of the world aflame with his adorations. Miss Snow came to New Rochelle to please a girl she worked with in theatrical stock to look upon the 'movies' for the first time in the making. She fell under the influence of the feathered songsters who flitted from tree to tree offering her an invitation to stay. Stay she did, and here we have seen some of her best work. Her 'Lucile' was a masterpiece. Owen Meredith, the author of the wonderful poem, would have adored the girl who caused his character to come to life in the name part. Critics world wide have placed the laurel upon the brown of the adorable 'Peggy.' No words of mine could make the bloom brighter." A Fan Club Forms: The Moving Picture World, August 15, 1914, told of her admirers: "Miss Marguerite (Peggy) Snow, leading woman of the Thanhouser films, who is doing exceptional work as Countess Olga in The Million Dollar Mystery, had quite an honor conferred upon her by some of the photoplay fans of America, who love to see her on the screen. Recently a letter came from Miss Kathryn Temple, Northboro, Massachusetts, asking 'Peggy' to accept the honor of honorary president of the 'Peggy' Snow Club, a gathering of young women admirers who follow her work closely on the screen; who adopt so far as possible, clothing patterned after those worn by the best dressed women in the 'movies,' and meet once a month to plan for the present and future welfare of the club. Miss Snow was prevailed upon to accept the honor, and promised to send a letter of greeting once each month to the 'Peggy' Snow Club, and sent, also, a large photograph in one of her best poses for the club to retain, with the admonition that it be framed and be held in the custody of the president until her successor was elected, when the portrait would pass into the keeping of the new president. "Of course, these 'Peggy' Snow clubs will form, and to each Miss Snow plans to send a photograph so that the gathering of girls may have material evidence of her love and loyalty. And should requests come to Miss Snow from Great Britain, 'Adorable Peggy' plans to acknowledge them and send her autographed photograph with the same restriction, i.e., that it will remain the property of the club and be held by each succeeding president. The plan advanced by Miss Temple was a club that would go to some theatre in a body when one of the films advertising Miss Snow was shown, and after the entertainment meet at the home of one of the members to chat and dine and discuss. Sixteen members compose the first 'Peggy' Snow Club, and the membership is unlimited." Exit New Rochelle: Miss Snow was a prominent Thanhouser player until the spring of 1915 and was seen in many films. By early 1915 her ambition had faded, and to her friends she expressed a desire for a change of scene. The last Thanhouser film in which she acted was The Patriot and the Spy (released June 7, 1915), which was produced during the first week of May 1915. Her Guardian Auto, released June 11th, was filmed earlier. She left the East for California with her infant daughter Julie, on Sunday, May 16, 1915. The New Rochelle Paragraph, May 7, 1915, told of her move: "Mrs. James Cruze, better known as Peggy Snow, will sever her connections with the Thanhouser Company on May 16, and will hereafter be one of the leading ladies for the Metro Film Co., situated in Hollywood, California. Peggy Snow has been connected with the Thanhouser Co. for the past five and one-half years. She played the villainous countess in The Million Dollar Mystery and was Zudora in the picture of that name. Miss Snow announces that she has signed a year's contract with the new firm and has given the firm an option of another year on her services. "James Cruze and Peggy Snow were married on the Pacific Coast about three and a half years ago, after a romance, the scenes of which were laid in New Rochelle. Mr. Cruze came to Thanhouser's a year after Miss Snow, but lost no time in winning Peggy's heart. One little daughter, Julie, was born to them. Peggy Snow said, 'I am certainly sorry to leave all my friends in New Rochelle. I have had a great time in the city, and have built up a fine little home at 26 Stephenson Park. The city will always have a warm spot in my heart. Opportunity has knocked at my door and I am taking advantage of my chance to better myself.'" The New York Dramatic Mirror, May 5, 1915, told more: "Marguerite Snow, who has within the past year leaped into wide popularity by reason of her work in The Million Dollar Mystery, has been signed by Fred J. Balshofer, head of the Quality Pictures Corporation, and will play the leading roles opposite Francis Bushman in the feature productions which will be released once every six weeks on the Metro program. In a search for the leading lady for the Quality pictures Balshofer interviewed over a score of prominent screen stars. Many names were mentioned during the past two weeks of stars having been chosen by Mr. Balshofer, but his final decision was not reached until last Thursday, after the choice had narrowed down to two players. Miss Snow was engaged because it was considered that she had the qualities necessary in the leading woman playing opposite the virile Bushman. Miss Snow will leave for Los Angeles on May 6. Her first appearance with Bushman will be made in The Second in Command, released the latter part of June on the Metro program. For the past five years Marguerite Snow has been one of the stars of the Thanhouser Film Company...."
The Evening Standard, New Rochelle, New York, May 13, 1915, had still more on the subject: "'Peggy' Snow, for five years the principal leading woman of the Thanhouser Company and the Thanhouser Film Corporation, leaves on Sunday, or as soon as she completes an important picture she is working in. She is to go to California to play opposite Francis X. Bushman in the Metro Company. While Miss Snow's many friends rejoice over her good fortune, which brings with it, so it is said, a salary three times the size of that she is receiving here, they are sad because she is leaving them. It is likely that tomorrow night's reception to her husband, James Cruze, and to Sidney Bracey, who leave for the West on Saturday, will really turn into a farewell to 'Peggy.' The young star is under a two-year contract with the Metro Company, and it is likely that she will remain longer, unless Thanhouser makes a better offer at the end of that time. She is to travel by train straight through, with her little daughter Julie and her maid and the child's nursemaid. "'My husband and I have learned to love New Rochelle,' said Mrs. Cruze, today. 'But it was not difficult to do that. We had intended building a home here, and it almost breaks our hearts to leave. But I have a big offer, and I would be foolish not to accept it. I would rather live in New Rochelle than anywhere else in the world. I am not fickle and we may still return.'" Mrs. Jimmy Cruze: "That Snow-Cruze Lady," an article by Wallace Franklin appeared in The Photoplay Magazine, October 1915: "This story is supposed to be about Marguerite Snow but really it isn't about her at all. It's about Mrs. Jimmy Cruze. Of course Marguerite Snow and Mrs. Jimmy Cruze are one and the same but nevertheless, they are very different. At the Quality Studio out in Hollywood I caught a quick glimpse of Marguerite Snow, a superb creature in The Second in Command, acting her part with an intensity and fervor responding to Bushman's impetuous mood as the flying sparks from an anvil respond to blows from a hammer. "The next day I went to a little Hollywood bungalow to interview Marguerite Snow, but instead I had a little breezy chat with Mrs. Jimmy Cruze and the one and only Julie. The light in her soft brown eyes as she talked of Julie and of her home was as different from the sparkling brilliance I had seen at the studio as the glow of a firefly is from the sputter of an arc light. For there are just two big things in which Mrs. Jimmy Cruze is interested - Julie and her home. "Julie, Mrs. Jimmy informed me, is going to have her own sweet way about her career. She certainly comes from a theatrical family but when she made her debut in the pictures in a scene from The Million Dollar Mystery, she acted in a scandalous manner. 'Maybe though,' said Mrs. Cruze, 'her exhibition of temperament goes to show that she has histrionic ability. It's not merely temper.' Certainly, if Julie ever was afraid of the camera, she has mastered her emotions to a marked degree for one so young, as the cameraman had difficulty in taking any photographs of Miss Snow without chaining the ever present Julie to the porch. Most babies are immortalized in one way or another, but Julie Cruze will go down into fame of the near future as the youngest heroine of a five reel feature ever made. Every month since Julie's debut in this vale of sorrows her fond parents have had about 25 feet of movie film taken of her, and it is their intention to spring the animated biography on her at some future date. "'I guess the real reason why I liked moving pictures better than I ever did the stage is because when you are working in pictures you get a chance to settle down and have a home, while when you are on the stage life is just one hotel after another. I started out on the stage when I was 14 and was dragged around all over the universe by unfeeling managers until five years ago, when I got a chance to go to work for the Thanhouser people in New Rochelle. You don't know what a relief it was to get settled down somewhere for the first time in my life. I had a great time with Thanhouser people, but I am certainly enjoying it here. "'I'm afraid you didn't get much of an interview,' she said as I started for the door and sidestepped Julie and her playthings on the floor. Perhaps I didn't, but I made the discovery that charming as Marguerite Snow is, Mrs. Jimmy Cruze has her left at the post." With Metro: The New Rochelle Pioneer, September 4, 1915, reported: "Marguerite Snow Cruze, now with Metro at Los Angeles, submitted to an operation last week and her place will be taken by another star in the third release of Quality Pictures Corporation. Peggy is in The Second in Command and The Silent Voice Bruce Weyman, that great boy with the wonderful voice, also appeared as 'atmosphere' in The Second in Command, and although he was on the screen but a minute, those in New Rochelle who knew him were glad to give him the once-over." The same newspaper, issue of December 25, 1915, printed this item: "Marguerite Snow was the recipient of a unique Merry Christmas on Monday evening, when her husband, James Cruze, telephoned her at the Hotel Algonquin [in New York City] from California. The conversation lasted for just three minutes and lessened the amount in the former Thanhouser star's pocketbook by $45." The Moving Picture World, March 4, 1916, told of a mishap: "Marguerite Snow, the Metro star, who was last seen in The Upstart and Rosemary, and who has just completed the stellar role in the new five-part production, A Corner in Cotton, has just recovered from injuries she received while working in her last feature, and which nearly cost her her life. While racing in an old-fashioned buckboard to catch a train on the outskirts of Savannah, Georgia, one of the rear wheels came off and Miss Snow was thrown violently into the roadway. She rolled for several feet over the gravel and rocky surface, and in addition to severe bruises and scratches all over her body and face she suffered three fractured ribs." While she was a leading lady for Metro, she maintained addresses in California with her husband, James Cruze (who was also with Metro at the time), and in the East at 220 West 98th Street, New York City. Most of her work was done in the East. She appeared in nine Metro productions, among which were Rosemary, The Upstart, A Corner in Cotton, His Great Triumph, The Half-Million Bribe, and Notorious Gallagher. "'Well, yes, I have,' said Miss Snow, with one of her good natured smiles playing upon her face. 'That is to some extent.' Then Miss Snow assumed a theatrical attitude and very dramatically said: 'I thought I had put it all behind me - and that I was away from it - until I met you and my previous director, Edgar Jones. You see when I was with the Thanhouser Company I think one-fourth of the exteriors we made were around this picturesque community. I came to know every policeman in the neighborhood, all the street gamins and the old-timers like a book. I have been obliged to eat in some of the most horrid looking places, and all that. But I got away from it. Some way or another I seemed to be cast for parts that kept up around Broadway, Fifth Avenue and those places. Then came The Half Million Bribe. We had a lot of Bowery stuff in that. And now Buttsy's Glory, where we are destined to work for a week or more. Is it any wonder I am so well known here?'" 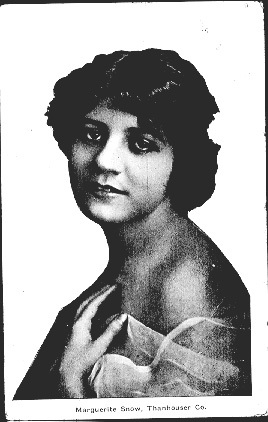 The October 1916 Motion Picture News Studio Directory noted that Miss Snow was 5'5" tall, weighed 109 pounds, and had brown hair and brown eyes. Her hobbies included motoring, horseback riding, and golf. An advertisement in the same directory noted she "may be secured upon application" and was being represented by Ouida Bergere, of the Players Engagement Department of the American Play Company, Inc. (33 West 42nd Street, New York City). The 1918 edition of the Motion Picture Studio Directory gave her home address as 220 West 98th Street, New York City. By June 1916, Miss Snow had moved to Ivan Films (Ivan Abramson), where her first release was The Faded Flower (August 1916). Domestic Tranquility in May 1916: The following article by Elizabeth Petersen appeared in Motion Picture World, a fan magazine, in May 1916: "SYMPATHETIC PEGGY - The keynote of Marguerite Snow's charming personality has been found at last. It is her frank, unassuming sympathy and interest for one and all with whom she comes in contact, that characterizes even her screen work. 'Nut-brown Maiden' she has been lovingly called by her intimates, but as Miss Snow, the beloved 'Lady Bountiful' of the masses, she is known to those fortunates who have been made happy by her fullness of heart and ever-ready purse. The dearest title of all to the little lady herself is 'Mother'; but not even the all-absorbing love with which she worships her baby daughter can exclude from her ready sympathies the numberless little kiddies whom she has befriended from time to time and who worship devoutly the divinity that understands and loves them. "Jimmy Cruze does not think there is any one just like his comrade wife, and, tho their present engagements keep them apart, it is truly a case of 'Absence makes the heart grow fonder.' Uncle Sam's mail service is filled with letters bubbling over with news at such times as the telephone wires are having a rest from their chats. Marguerite Snow is an interesting personage, but 'Mrs. Jimmy,' the adored wife and worshiping mother, is a very much more surprising one. Nothing pleases her quite so well as to prowl around the kitchen, making all sorts of experiments with her cookbook, much to the delight of her husband and many friends he chooses to bring home. He frankly confesses this is a method of making them envy him his lovable little pal, who is never quite submerged in the role of wife." Activities in 1917: In January 1917 it was announced that Miss Snow was with Artcraft Pictures Corporation, playing opposite George M. Cohan in his first motion picture, Broadway Jones. She was later seen in the Astra-for-Pathé film, The Hunting of the Hawk (April 1917), the Astra-for-Pathé film, The First Law (August 1918), and the 1919 Metro release, In His Brother's Place, among other films. An article in the Detroit Journal, April 30, 1917, told of Miss Snow back on stage: "If there is a dull moment in Broadway Jones, George M. Cohan's starring vehicle at the Regent theater, the first half of the week, it escaped us. The story scurries along with a zip from the time we are introduced to 'Broadway,' tied down to a chewing gum factory in a 'tank' town, to the conclusion, where Jones, satisfied with having had his fling among the bright lights, marries his uncle's stenographer and settles down to the management of the gum factory. It is Cohanesque, and if you've ever watched George M's antics, you know what is meant. Miss Marguerite Snow, who plays the part of the drab little stenographer, seems to realize that the piece has been written as a vehicle for Cohan and no one else, but her work is thoroughly satisfying. Russell Bassett, whose face has become familiar to motion picture devotees through his long association with Mary Pickford's companies, is cast as the ultra-conservative Uncle Andrew." "Miss Snow has no definite plans for the immediate future. She is considering several offers to return to pictures, but as yet has accepted none. 'I'm going East to be present at my baby's birthday party. Oct. 24 is her birthday.' Miss Snow (Mrs. James Cruze in private life) avers her baby, Julie, is the smartest child in the world. 'Just think of it,' she waxed enthusiastic. 'She will be 4 tomorrow, and this is what she said over six months ago. Someone pointed to the American flag and said to Julie: 'Julie, who does this flag remind you of?' 'George Cohan,' replied the baby, 'And who is George Cohan?' persisted the questioner. 'My mamma's leading lady,' was the quick reply.'" 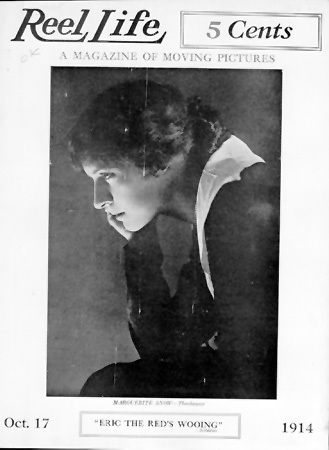 The September 22, 1917 issue of The Moving Picture World informed readers that Marguerite Snow attended the convention of the Virginia State Exhibitors' Association, Oceanview, Virginia, and then signed a contract for a personal appearance tour in principal cities in the South. She left New York for Martinsburg, West Virginia on September 7, opening at the Central Opera House the following day with an afternoon and evening appearance. The tour was planned to extend for four weeks with an option for an additional four weeks provided it did not interfere with Miss Snow's filming commitments. "'I never worked for Mr. Griffith.' Here was a startling story - a girl who had been in pictures all this time and never been inside the Biograph studio, and was not discovered by Griffith. And yet they say there's nothing new under the sun! Nor did Marguerite have to run away from home to go on the stage. If she hadn't done it voluntarily her parents would, probably, have compelled her to do it. Her father was Billy Snow, a famous minstrel man in the days when it was open season for that form of entertainment. They lived in Savannah, Georgia, and little Marguerite passed her childhood checking off the number of years before she would be permitted to become an actress. And she didn't have any discouragements to encounter. Her debut was in James O'Neill's last revival of The Count of Monte Cristo, after which she was engaged by Henry W. Savage. She was one of the many 'college widows' and enjoyed a great deal of success before she ever heard of movies. "In those pioneer days, successful actresses who engaged in film adventure, were a little ashamed of it. They regarded it as slumming, and concealed their identity, so as not to lose caste. Marguerite Snow was no exception. When she went to work for Thanhouser she didn't want her friends to know about it so she changed her name. She called herself 'Margaret' Snow. 'Funny, isn't it?' she said. 'But it isn't half as funny as some of the things that actors and actresses have their press agents send out to increase their popularity. Every time I pick up a moving picture trade paper, these days, I discover that a certain star has just recovered from another automobile accident. I wonder how she ever gets time to do a picture. There's another one that seems to have a penchant for buying clothes, and there's usually a story a week to this effect. It looks to me as if she must be the buyer for a wholesale clothing house on the side. "'Playing with the baby,' she declared. Another startling fact - a young actress who is a wife and mother, and isn't afraid that it will make the public hate her if it becomes known. Her husband is James Cruze, and a mighty fine actor too, separated at present from his fireside by the entire width of the American continent, for the Cruze-Snow home is in New York, and James is at Lasky's, in Hollywood. Miss Snow's latest screen activity is the Wharton serial, The Eagle's Eye, made at Ithaca, with which patriotic creation readers of Photoplay are familiar. Before that she was with George M. Cohan in Broadway Jones, and in various Thanhouser, Metro and other productions, and of course you remember the heroine of The Million Dollar Mystery. She had just finished the Flynn picture when I met her. 'What are you going to do next?' I asked. "'In other words, you know the Broadway patter, even if you don't use it in your business,' I said. "'I didn't say we made pictures - I said we had nice offices. We didn't get as far as making pictures.' I can't think of anyone but Marguerite Snow who would not have added, 'But of course you mustn't say anything about that in print.' A remarkable girl, and that's the truth." The 1920s and Later: James Cruze divorced her in 1922. Their daughter, Julie, remained in the family home with her mother. Later, Marguerite Snow married Neely Edwards (the stage and screen name of Cornelius Limbach; life dates: September 16, 1889 - July 10, 1965). Marguerite Snow played in films through the 1920s. During the late 1930s Miss Snow was in contact with James Cruze, and with Julie she visited his home on numerous occasions. Marguerite Snow died of kidney complications at the Motion Picture Country House and Hospital in Woodland Hills, California, on February 17, 1958. Services were held on February 20th at Forest Lawn Memorial Park. At the time of her death she and her husband, Neely Edwards, maintained their residence at 1930 Stewart Street, Santa Monica, California.